Today is Pi(e) Day, 3.14. There is a 159 following that 14 but that makes no never mind here. 3.14 is a day to make and share Pi(e)s. This event was created for our Festive Foodies group by Colleen of The Redhead Baker. I had originally planned on sharing a Moroccan Shrimp Pie. The recipe sounded delicious. I put it together last Friday and we sat down to dinner. We took a bite....uhoh...perhaps it was just the first bite....took a second bite....it was worst than the first. The culprit....lemon....so much lemon that it was actually bitter. I was so disappointed, not only because I had anticipated a delicious dinner but because I was planning on that recipe for this event. I began thinking of other ideas....I really wanted to stick with a savory pie. I ran through all the possibilities.... I had already shared chicken pot pie, beef pot pie, Irish stew pie, tomato pie, lobster pot pie, and a pork and apple pie. Not too mention the numerous quiches......Hey, how about a quiche? Quiche was a perfect idea because not only would it fit the bill for this event but it was the perfect recipe to share for our Food n Flix selection this month, Runaway Bride. Runaway Bride is a fun little romance comedy starring Richard Gere and Julia Roberts. It was the movie chosen by Ali over at Fix Me a Little Lunch. You still have time to join in the fun. Check out Ali's announcement post to learn how. This film is about a woman (Roberts) who has left 3 men standing at the altar as she bolts from the ceremony. She is currently engaged to the 4th man who is convinced that he is the one. A cynical, down on his luck reporter (Gere) decides that she is going to follow past practice and bolt on this poor guy as well. He arrives in town to write a story. It is a fun, predictable film that we enjoyed. Of course, this is coming from someone who also loved Pretty Woman and who considers When Harry Met Sally one of my favorite films. One of the results of the relationship that occurs between Roberts and Gere is that she is left doing some soul searching after he points out to her that "she doesn't even know what kind of eggs she likes". Gere asked each of the intendeds what Roberts favorite breakfast was and they all responded with a different type of egg adding "just like me". One scene shows Roberts cooking up every egg dish known to man, and trying them all to see which it is that she DOES prefer. Watch the film to find out what she discovers about eggs and about herself. What then is more perfect to combine these two events than an egg pie aka quiche? Absolutely nothing. My blues over the failed dinner were dispelled and I began rummaging in my pantry and refrigerator to see what kind of quiche I should make. Spring Vegetable, Lorraine, Ham and Broccoli, Ham and Asparagus, and Cauliflower and Leek were already written about so I needed something new. I found some smoked salmon in the freezer and some Boursin and Swiss Cheese in the refrigerator. I always have a ton of eggs, thanks to my ladies who live in my back yard. I also found some fresh dill that I thought would be perfect with the salmon. While the crust was pre baking, I whisked together the eggs, Boursin cheese, cream and dill. When the crust was nice and browned. I layered the smoked salmon along the bottom of the crust. Sprinkled the Swiss cheese over the salmon and then poured the herbed custard over all. Popped it in the oven for about an hour and it turned out beautifully. The smooth creamy goodness of the herbed cheese custard was perfect with the smoky richness of the salmon. The best thing, in my opinion, about quiche is that it can be served as an elegant breakfast, a lovely lunch or a light dinner. Serve it up with a seasonal fruit salad or some leafy greens and it is a complete meal. When we finished watching Runaway Bride, I knew right away that I was going to make some sort of egg dish. I grabbed this cookbook, that I had received as a gift from my sil, Mary, and was thumbing through it. I had chosen another egg recipe but then changed it up when my first pie was a fail. Mary bought me this book because I raise laying hens and am constantly looking for new ways to use up the abundance of eggs they provide. I am going to share this post over at Foodies Read. It has some great ideas and I've made a couple of recipes including this frittata and these eggs benedict that turned out wonderfully. Make sure you stop by and see what other great pies are being shared today. You will find links right underneath this easy peasy recipe. I like salmon quite a bit so this certainly appeals to me. Love the step by step instructions. Thanks Tina, quite tasty, in fact I'm having leftovers for breakfast as I read everyone's posts. Sorry about your 1st pie, but glad you managed to make something else that sounds tasty too! Yes the second pie was a success Caroline. Boy, this sounds delicious! I'd love to make it for one of these Lenten Fridays! Sorry about the first pie, but I'm glad you re-did one and joined us for the event. Thanks for sharing. I'm curious about your Moroccan recipe now. It called for 2 whole lemons, one peeled and diced and the other juiced. I don't know if the lemons they used were a lot smaller or if I needed to cook off the liquid a bit longer or what but the dish actually soured our stomachs. Thanks Michelle, I needed a success after my fail. I'm so sad about your first pie, but I love this second one. Smoked salmon and herb sounds like the perfect quiche combination. I can't wait to try this! It turned out really well Carlee. OMG Wendy this sounds delicious. I'm a HUGE fan of salmon and Boursin together. I can't wait to try this. I've made your asparagus quiche, so I know you can rock a good one. So sad about your first pie! I'm so glad you enjoyed the asparagus quiche Karen. This one is definitely a keeper. This is just delicious. I love this for brunch and for Friday Lenten dinner. I love a low carb light dinner. Delicious. I love that you made a quiche AND that it fits in for Food n Flix too! I *still* need to watch the movie - eek! Thanks Amy. Isn't it sad that life gets so busy we have a hard time fitting in a couple hour movie? I like that you made a savory pie! And I'm always a fan of fresh herbs. 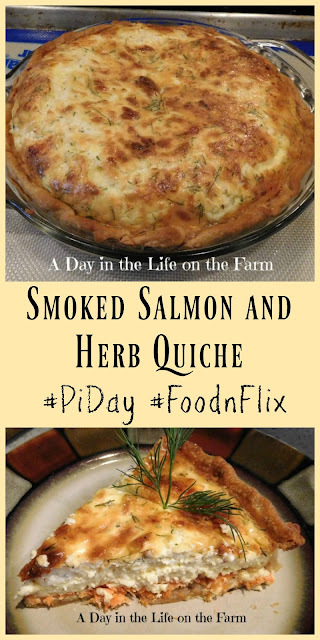 LOVE smoked salmon, this sounds like the best quiche ever! Thanks Evelyne. It was scrumptious.